This week saw the fifth anniversary of the most destructive of the thousands of earthquakes that have hit Christchurch and its neighbouring areas since September 2010. Christchurch is “home” to me. I haven’t lived there for decades, and don’t suppose I will again. But almost all my wider family live there, and my ancestors for 150 years or more have lived in and around Christchurch. Many of my family were, and are, badly affected by the 22 February quake: my elderly parents managed to get down the damaged stairs of their multi-storey apartment block, but never even got inside the building again. The church where they had been raised, and married, and where several generations had been buried from, lay in ruins. On Friday, presumably to mark the anniversary, the Reserve Bank released an issue of the Bulletin looking at how the economy of Christchurch and the Canterbury region has fared in the years since the worst of the quakes (it is billed as “The Canterbury rebuild five years on”, but is mostly about economic activity in Canterbury, of which of course the rebuild is a significant, if temporary, new part). The article builds on an earlier one along much the same lines published in September 2012. Even allowing for the lower unemployment rate in Canterbury than in the rest of the country, it would seem surprising if retail sales per capita had grown so much more strongly than in the rest of the country (estimated retail sales 6 per cent faster – see chart – and population growth perhaps 2 to 3 percentage points slower. But in commenting today, I didn’t want to focus on the fine details of a useful article. Instead I wanted to comment briefly on three thoughts that struck me as I read. First, in an article written by officials in a government agency, the authors are quite constrained in what they will have felt able to say about the rebuild process and the role of central government in it. It is perhaps useful to read the Bank’s article alongside, say, the article in this week’s Listener. And the Bank’s primary focus is, of course, on resource pressure issues, not the effectiveness or otherwise of the rebuild process. But silence on some of these matters risks being read as endorsement. I’ve noted already the comment about the commercial rebuild process, but if the authors are right that there is a lot more to come, perhaps it is worth pondering what role central government has played in slowing down the process. For example, the use of compulsory land acquisition powers, in pursuit of some official vision of what the city centre “should look like”, which will have contributed to much higher than necessary land prices in the central area. Or the uncertainty which central government has created by promoting (almost certainly uneconomic) so-called anchor projects, and then making almost no progress on them – leaving private investors considering projects that would sensibly locate close to the “anchor projects” in limbo. Second, a couple of charts in the article prompt a “what might have been” thought about the entire economy. Some have argued that the New Zealand economy would have performed much more poorly over recent years without the repair and rebuild process. If anything, I think the opposite is true. Right from the early days following the earthquakes, the Reserve Bank was focused on the size of the rebuild expenditure, and associated pressure on resources, that was to come over the following few years. As probably the largest investment programme in New Zealand (share of GDP) since the Think Big projects in the early 1990s, and with a very domestic spending component to it, it was quite right for the Bank to focus on those issues and risks. But, with the benefit of hindsight, I think that doing so helped leave the Bank more reluctant than it should have been to have cut the OCR as the record of persistently low inflation kept building up. The sentiment was often along the lines of “it might be low right now, but it can’t last – look at all those resources pressures to come in Christchurch in the next few years”. If the economy had been fully employed, the repair and rebuild process would inevitably have had to “crowd out” some other economic activity – most probably from the tradables sector. In fact, we’ve had an underemployed economy throughout the last five years and could, with hindsight, have done with more demand, which would have generated more economy activity, less unemployment and a bit more wage and price inflation. Without the spectre of the rebuild programme, there might have been more chance of it being allowed to happen. Part of what I’m talking about is captured in these two charts from the Bank’s article. 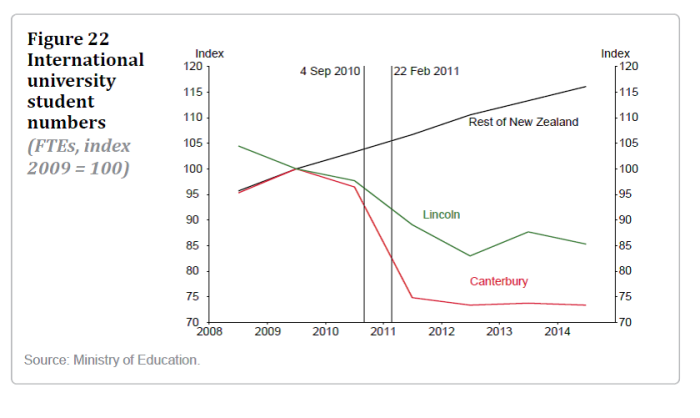 The labour market in Canterbury has been materially stronger than in the rest of New Zealand. 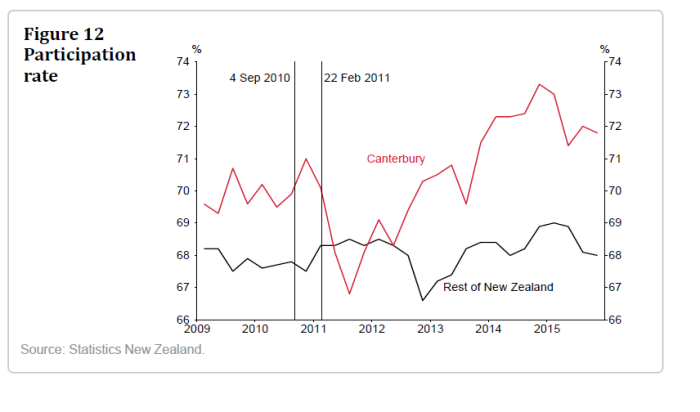 Even pre-quake, the participation rates were higher and the unemployment rates were lower (probably partly reflecting different demographics), but both gaps widened further in Canterbury’s favour as the demand/activity associated with the rebuild really got underway from 2013. With a lower OCR over the last few years, and the associated lower exchange rate, the whole of New Zealand could have enjoyed a milder version of this sort of buoyant labour market. The intense focused nature of the rebuild “shock” probably always meant that the Canterbury market, at peak, would be tighter than that in the rest of the country, but the rest of the country simply could have done materially better. Demand makes a difference, and monetary policy can either hold back or stimulate demand. 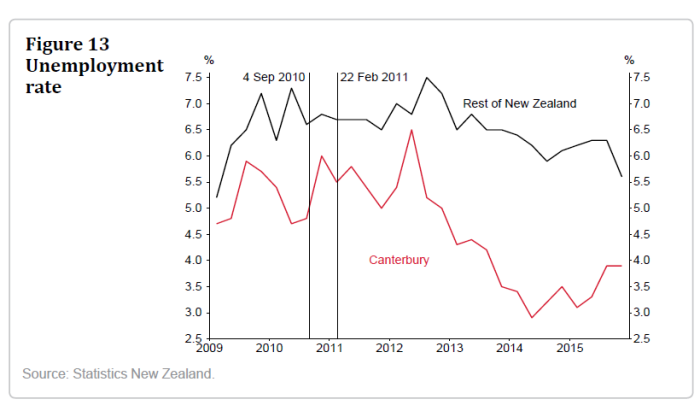 In real terms, wages in Canterbury have increased by about 8 percent since the earthquakes, whereas wages outside of Canterbury have increased about 6 percent in real terms. Hardly of a magnitude – 2 percentage points different in total over five years – that, repeated nationwide, would have been sufficient to have blown the inflation rate back through the upper end of the target range. 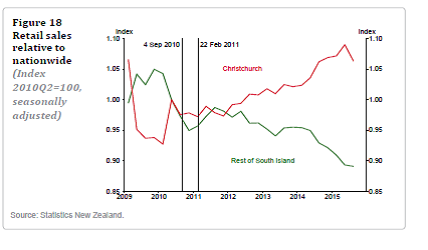 One can’t simply mechanistically translate one region’s experience into that for a whole country, but the simple comparisons outlined here point in the direction of what went wrong with monetary policy management in New Zealand in the last few years. With a huge non-tradables demand shock (which, in macro terms, is what the rebuild represents) New Zealand should not have had any great difficulty keeping inflation up around target in recent years – indeed, one could, if so inclined, have mounted an argument for it to have been a little higher for a few years, reflecting the intense one-off nature of the shock). My final set of thoughts, rather more speculative, is around the longer-term health of the Christchurch economy. The Bank repeatedly describes the Canterbury economy as being “resilient” (including in its press release) , but if anything I came away from the article more sobered and worried about the future of Christchurch than I had been. In internal debates in the immediate wake of the earthquake, I was always one of those who pushed back against the idea that there would be a wholesale exodus from Christchurch, from which the city would never recover etc. Apart from any other arguments, between risks of tsunamis, volcanoes, earthquakes, and floods where in New Zealand was really much safer in the longer-term? And there hasn’t been such an exodus – indeed, the population of greater Christchurch is higher it was in 2010. But there always was Professor Ilan Noy’s work suggesting permanent adverse effects (population and economic activity) from past overseas natural disasters. Noy is now at Victoria University and is listed as a co-author of the Reserve Bank’s article. The Christchurch economy has historically drawn strength from a number of areas. There was a large manufacturing sector, with a significant high-tech and export orientation. That sector hasn’t been materially affected by the earthquake and subsequent rebuild process – but then the overall manufacturing sector (especially outside the construction-related bits) has been performing poorly (per capita manufacturing value-added is now only around 80 per cent of what it was in the early 2000s). Christchurch has also built on the large rural hinterland – which is still there, and probably more intensive than ever as vineyards (to the north) and dairy displace sheep. But Christchurch has also become a reasonably significant location for export education (one of the worst sets of fatalities was a English language school for foreign students) and some combination of tourist destination and gateway to the picturesque South Island. 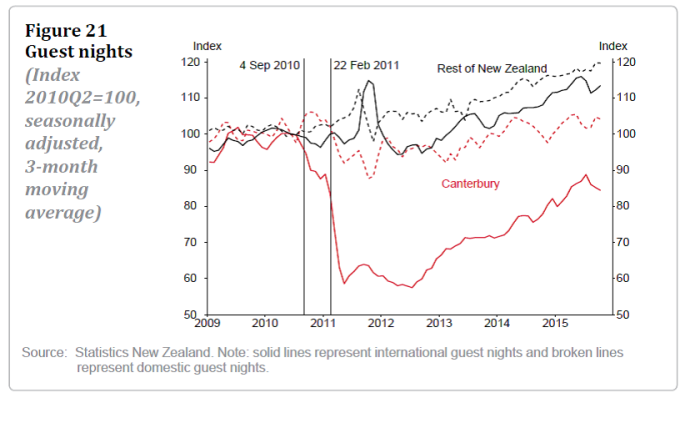 I’ve never been entirely confident that tourism is a robust basis for long-term high advanced country living standards (it isn’t tourism – much more of it than New Zealand has – that makes France or the UK prosperous), but some of the charts in the article were sobering. International numbers are recovering, but there is a very long way to go. Perhaps not too surprisingly (cause and effect) hotel capacity in Canterbury is only about 60 per cent of what it was. Or international student numbers, where there has been no recovery at all (although I gather the picture for graduate students is a little more encouraging). The chart for foreign fee-paying school students is even weaker. In particular, activity in the tourism and education sectors remains markedly below pre-quake levels. Without increased activity in other sectors, the labour market in the region could see a reversal of the improvement that has occurred in recent years, leading to reduced participation, higher unemployment and outward migration. No doubt activity in some of those tradable services sectors will recover further at some point, but how far and how quickly? In some way’s Christchurch’s tradables sector plight probably isn’t a million miles out of line with the experience of much of the rest of provincial New Zealand, which has struggled to cope with the effects of a persistently high exchange rate, out of line with the longer-term real economic fundamentals. In aggregate, economic activity in Christchurch has been held up by the repair and rebuild spending, but that won’t last for ever, and is no longer an impetus for growth (the volume of activity having now levelled off). “Buoyant” might have been a better description than “resilient”. Like many places in New Zealand, Christchurch is a nice place to live, but as the rebuild phase passes, there must be doubts about the ability of economic activity in the area to support high incomes for a growing population. It is a concrete illustration of the more general need for a reorientation of policy in directions that would generate a lower real exchange rate – a stronger competitive foundation – for at least a decade, to help unwind the adverse effects of the last decade: successive non-tradables shocks, exacerbated by policy mistakes, resulting in an exchange rate too high, it appears, to support, much growth in the tradables sector. As I noted, the Reserve Bank authors will have been constrained in what they could say. The same constraints don’t apply to Professor Noy. Perhaps a journalist could consider approaching him, and inviting him to elaborate on his thoughts on the Canterbury economy and the apparent fragility of its rebuild-fuelled activity?